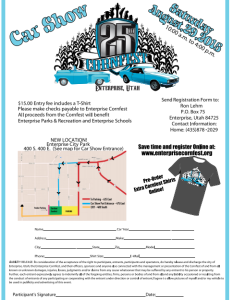 ENTERPRISE — A dollop of butter, salt, pepper, on top of the most tender and sweet corn on the cob is waiting at the 25th annual “Enterprise Cornfest” Saturday, 10 a.m. to 11 p.m., at Enterprise City Park, 400 E. 400 South, Enterprise. From festival activities during the day to dancing the night away, this is a festival that offers something for everyone. The Enterprise Cornfest usually has about 4,000 to 5,000 attendees, and it gets bigger every year, said Jared Moody, Cornfest chairman. Besides the corn eating, events include a softball and volleyball tournament, mechanical bull, half marathon and 5k, car show, booths, dutch oven dinner, live entertainment and dancing. “It will just be all around good family fun and entertainment throughout the entire day,” Moody said. Information and registration for the softball and volleyball tournaments and half marathon can be found online. Over 60 vendors will be set up, selling everything under the sun. There will be inflatables for the kids and a corn eating contest that anyone with a set of front teeth can participate in. 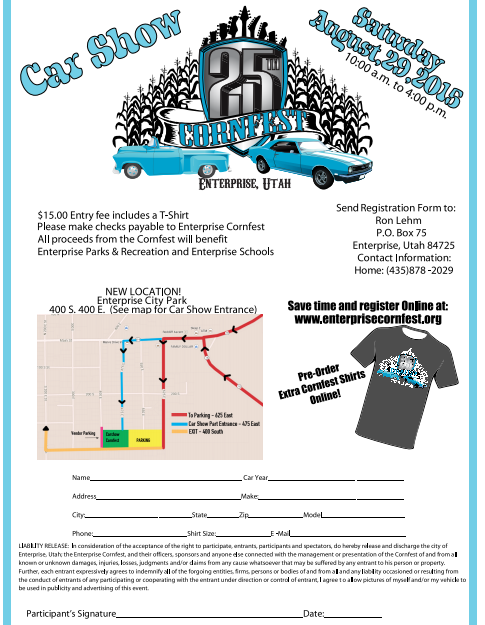 The car show, which will be from 10 a.m. to 4 p.m., has a $15 entry fee, which includes a T-shirt. All proceeds from the event will benefit Enterprise Parks and Recreation and schools. Entertainment will be provided by John and Bev Hyatt of Crystal Country, certified country dance instructors and professional disc jockeys. Anyone interested in becoming part of the entertainment can inquire by email. Entertainment is scheduled to run from 10 a.m. to 11 p.m. with a dutch oven dinner from 5-7 p.m. and dancing in the park from 7-11 p.m. The mechanical bull is provided by the Utah National Guard for all brave riders wishing to show their skills. When: Aug. 29, 10 a.m.-4 p.m.